Originally published by the Northeast Mississippi Daily Journal on Sunday, March 31, 2019. Written by Michaela Gibson Morris. Across Mississippi and the country, people are finding unwelcome surprises in their mailboxes. Medical bills they expected to be largely covered by their health insurance arrive with a much bigger payment due. They find out that the emergency physician, pathologist, anesthesiologist or radiologist that cared for them was not in their insurer’s network even though they sought care at an in-network hospital and often had no control over who provided the care. “From a consumer standpoint, there’s the physical trauma and then the financial trauma,” said Roy Mitchell, executive director of the Mississippi Health Advocacy Program. Mississippians have more legal protection than many across the rest of the country. If the health care provider accepts payment from their insurer, it is illegal for them to seek payment from the patient beyond their copayments and deductibles, a practice called balance billing. But some medical providers are ignoring the law, Mitchell said. Many consumers don’t compare the medical bills to the explanation of benefits they receive from their insurer and never realize they were paying more than required. Patients are getting caught between the lines. Insurers have been tightening reimbursements to rein in health care costs to keep rates low and maximize value for shareholders. Hospitals and physicians are pushing back to have adequate resources to provide care now and in the future. Stacy White is among those caught in the middle. Her husband was injured in an lawnmower accident in August. The Lee County woman took him for emergency care at NMMC, which is in-network for the insurance her employer provides through United Healthcare. What they initially thought was a dislocated shoulder turned out to be a broken bone that required surgery to repair and physical therapy to rehabilitate. A data company working with United Health alerted White that the emergency physicians who cared for her husband were out of network, and she should be at risk of being billed for more than she was responsible for. “There were so many bills rolling in from so many different places, I wouldn’t have been vigilant without the letter,” White said. Relias has resolved every case of balance billing brought to the attention of the group’s administration in Tupelo; they’ve heard from fewer than 20 patients. “We’ve made it right for every patient we know about,” West said. “We’re having to do it on a patient by patient basis.” Since forming in 2015, Relias has been able to secure contracts with all of the insurer networks that include North Mississippi Medical Center except one, West said. “We’ve been unsuccessful with United,” West said. United Healthcare, which has a network of nearly 100 hospitals and more than 11,000 physicians in Mississippi, acknowledged it is in active discussions with Relias in hopes of bringing them into the network. The insurer said it is very concerned about the national problem of surprise medical bills and price gouging by a small number of physicians exploiting their out-of-network status. “We support policy solutions in other states and at the federal level that will end surprise billing and take consumers out of the middle, including use of a benchmark rate based either on Medicare rates or the median contracted rate in a defined geography to determine the amount paid to out-of-network providers,” said United Healthcare director of communications Sarah Bearce in a written statement. Northeast Mississippi hospital leaders say they are doing what they can to protect consumers. North Mississippi Health Services requires the medical groups it contracts with to provide emergency care, anesthesia, pathology, radiology and neonatal intensive care to seek in network status with the insurers that include NMHS in its networks, said system president Shane Spees. The system is in the process of strengthening those requirements. OCH Regional in Starkville employs physicians providing emergency care, which means they fall under the hospital’s network agreements. The other physician groups contracted with the hospital are typically in network for the same insurers as the hospital. “There have been rare instances when this has not been the case,” said Susan Russell, OCH chief financial officer. In those instances, the hospital will contact the contracted group to request that the group accept the insurance as if they were in network. When a patient has out-of-network insurance, Baptist Memorial Health Care typically bills the insurer first. “We … expect them to make a fair and reasonable payment for the services rendered,” said Baptist director of public relations Ayoka Pond in a written statement. “Once a fair and reasonable payment is received from the insurance company, then we bill the individual for the member cost share according to their benefit plan.” Like other hospitals in the region, Baptist does require contracted physician groups to participate in the same insurance networks as the hospital. “However, because they are independent organizations, we’re not familiar with how they handle balance billing,” Pond said. None of the hospitals have the authority to require participation of private practice physicians who have hospital privileges to care for patients, but are not employed or contracted. Magnolia Regional Health Center in Corinth did not submit answers to Daily Journal questions for this story. 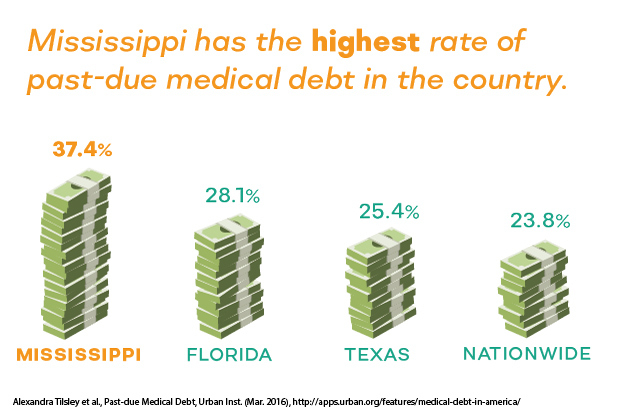 Mississippi’s balance billing law was groundbreaking in 2013, but needs to be updated, according to a report from the Harvard Law School Center for Health Law and Policy Innovation. Establish transparent, reasonable payment standards for out-of-network providers that operate at in-network facilities along with a clear, fair process for resolving payment disputes between providers and insurers. Allowing the state or federal government to set reimbursement rates is not a good solution, Spees said. Insurers and health care providers do need to be on more even footing. “The current (balance billing) law favors payors,” Spees said. In some cases, out-of-network insurers are avoiding contracts, so they can unilaterally set payments, Spees said. If the hospital or medical provider rejects the payment as too low, the insurer sends a check to the insured, making it their responsibility to pay the entire bill. Spees would like to see insurers’ networks more closely scrutinized for adequacy by federal regulators, who oversee the Medicare Advantage plans. The reality is that private insurers cannot continue to carry the load for the entire health care system, Chaney said. Yet if hospitals and providers aren’t adequately funded, they can’t keep their doors open.